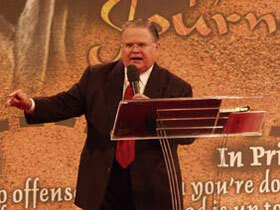 Cornerstone Church was founded by Pastor John C. Hagee in May of 1975. From its humble beginning with a congregation of less than 100, Cornerstone has grown into a church of more than 17,000. Cornerstone impacts the city of San Antonio, the United States and the world with its national and international radio and television ministry. We are greatly honored by your presence and seek to serve you in any way that will spiritually enrich your life. The phenomenal growth of this congregation has been due to the commitment we have made in reaching out to the individual needs of the people who worship here. At Cornerstone, we exalt one Savior, Jesus Christ. We proclaim one message, His Gospel. We purpose one thing, to demonstrate His love to our city, our nation, and the world. As this informational website illustrates, we have many ministries and activities at Cornerstone designed for every age and level of spiritual development. My wife, Diana, and I would like to encourage you to get involved in these activities and experience the difference that Jesus Christ and an exciting church family can make in your life. Whether you are single, married, attending with your family, or just "checking things out" on your own, this is the church you have been looking for.